State of 3D Printing 2018: How do businesses use 3D printing? Last week we officially announced the latest edition of the State of 3D Printing! This new eBook holds the keys to unlocking the secrets and trends of the additive manufacturing industry. Over a 1000 respondents from this industry helped us creating this analysis by sharing their expertise and experience. Now, we would like to highlight some of the findings in blog posts by further analyzing certain aspects. In this blog post, we will analyze how businesses have used 3D printing over the past year and how they think it will develop. First, we will analyze the return on investment, followed by amount spent on 3D printing. After that, the main reason and applications for using additive manufacturing will be analyzed to be then concluded by analyzing if 3D printing is truly a competitive advantage according to these businesses! The return on investment when compared to previous year’s results has seen a positive development. This year’s results showcase that 46% saw a greater ROI, 49% saw no significant change, and only 5% saw a lower ROI. Last year’s results said that 47% saw a greater ROI, 45% saw no significant change, and 8% saw a lower ROI. Of course, this is a great development for 3D printing. 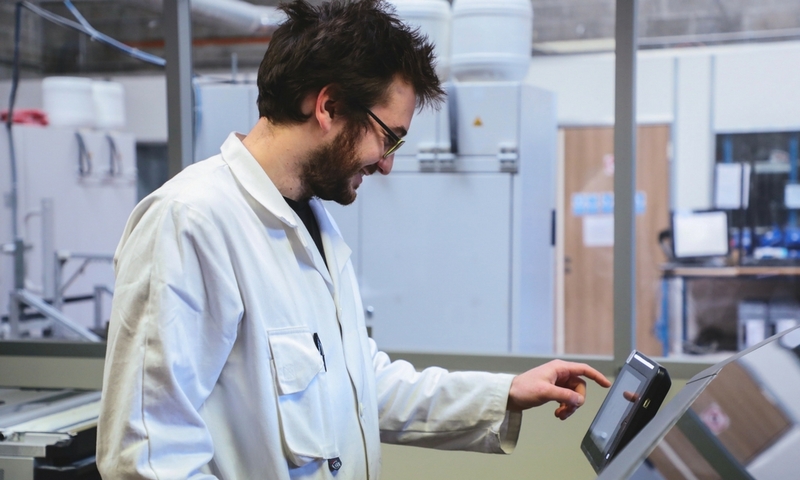 It shows that investing in additive manufacturing had a positive influence on businesses. A stable result over time that still shows users are feeling satisfied with their investments in 3D printing. So how much money did these businesses invest in 3D printing over the past year? 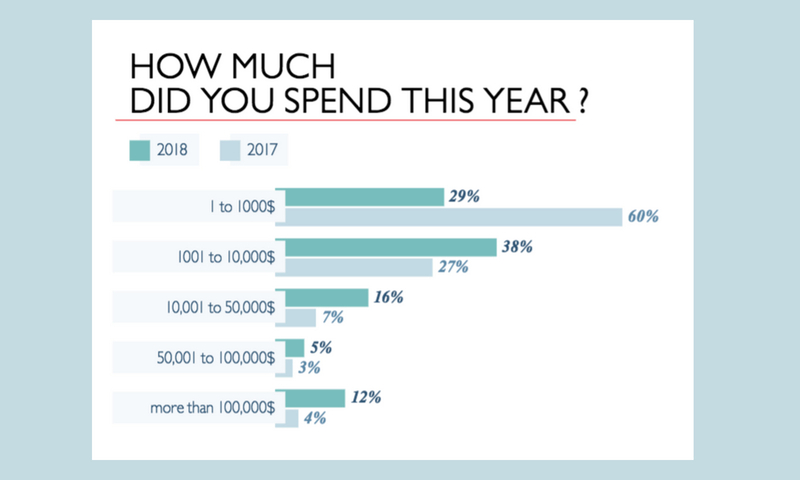 29% spent between $1 to a $1000 compared to a tremendous number of 60% in 2017’s results. 38% spent between $1001 to $10.000 on 3D printing compared to 27% in last year’s results. A proper 16% spent between $10.001 to $50.000 on 3D printing compared to a mere 7% from 2017’s results. 5% spent between $50.001 to $100.000 on 3D printing compared to 3% from last year’s results. A good 12% spent more than $100.001 on 3D printing compared to only a small 4% from 2017’s results. The situation can be seen as a very positive development as it shows that businesses have more faith in the use of 3D printing shown by the increased budget for additive manufacturing compared to last year’s results. This can be traced back to the 11% increase in spending between $1001 to $10.000, the 9% increase in the spending between $10.001 to $50.000, and in the 8% increase in spending of over a $100.001 on 3D printing. Finding out what the reasons are for businesses to use 3D printing is not only interesting in general, it is useful for companies to find out about different applications for additive manufacturing. Our respondents mostly benefit from 3D printing when it comes to complex geometries (48%), lead time reduction (39%), and cost reduction (30%). What these numbers tell us is that businesses find that 3D printing is able to minimize time spent on production, is able to create designs that other manufacturing methods are unable to produce, all the while keeping the costs in check – this is because e.g. 3D printing doesn’t require expensive molds that traditional manufacturing methods do. This whole situation shows that 3D printing offers many benefits, and that it could be a true asset for other businesses in the future. Curious as to what kind of 3D printer is able to reduce lead time? Read our blog post on the fastest 3D printers here. 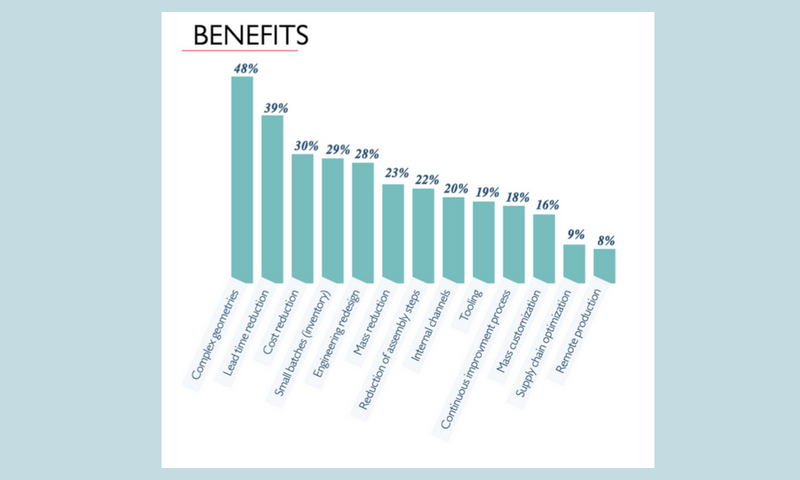 Now that we know what the benefits are of 3D printing according to our respondents, we were curious as to in what way companies precisely apply 3D printing for. 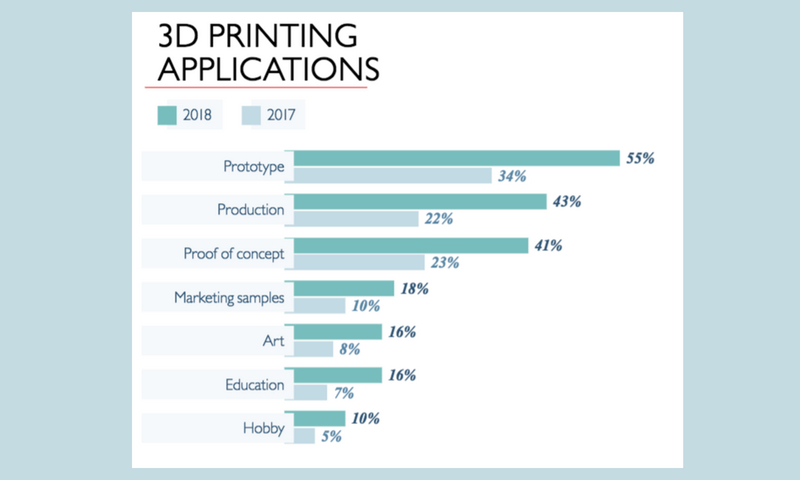 In this year’s results, it shows that businesses mainly use 3D printing for prototyping with 55% compared to only 34% in last year’s results. Prototyping is becoming cheaper and easier with 3D printing such as when our cheapest prototyping option is used. Curious? Read about it here. 43% also use it for production whereas last year’s results only 22% said so. Last but not least, 41% also use it proof of concept with only 23% saying so in 2017’s results. This situation is a very positive development. It shows that companies put more faith in 3D printing by applying it to more aspects of their business. Especially since the use of 3D printing for production doubled, it is safe to say that additive manufacturing has earned its place in the big league of manufacturing methods instead of solely using it for customized products or prototyping. 3D printing is already being used to fully produce and build houses with concrete 3D printing. Many businesses see 3D printing as a way to be more competitive on their market. 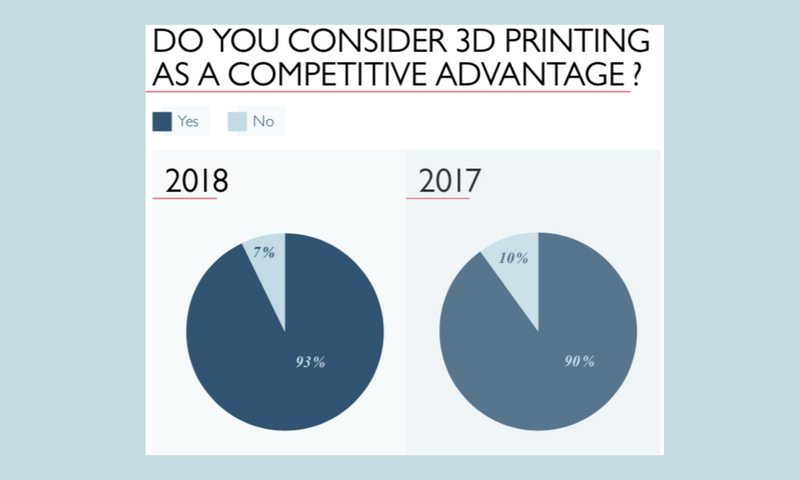 We asked our respondents this year as well if they see 3D printing as a competitive advantage: 93% saw 3D printing as a competitive advantage compared to 90% from last year’s results. Of course, this is a great development for 3D printing. Although a small positive difference, it is an important difference. It shows that businesses are feeling satisfied and confident with the use of 3D printing, and that they see how efficient it is to differentiate themselves from their competitors. Curious for more additive manufacturing trends? 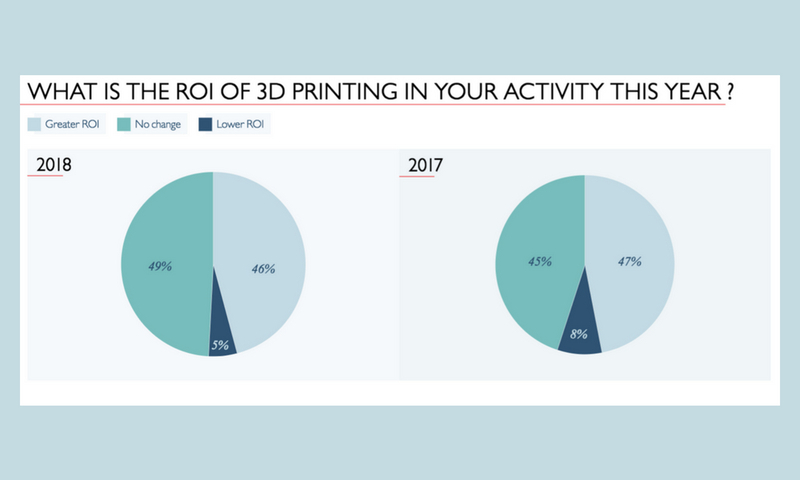 In the latest version of the State of 3D Printing we analyzed how regular businesses apply 3D printing, but what about the power users? What about certain industries such as industrial goods, consumer goods, and aeronautics? Or, if you’re curious about the manufacturing type itself, what 3D printing material or technology is used most? Find out in the 2018 edition of the State of 3D printing downloadable for free here! Want to freshen up your memory? Find the 2017 State of 3D printing edition here.